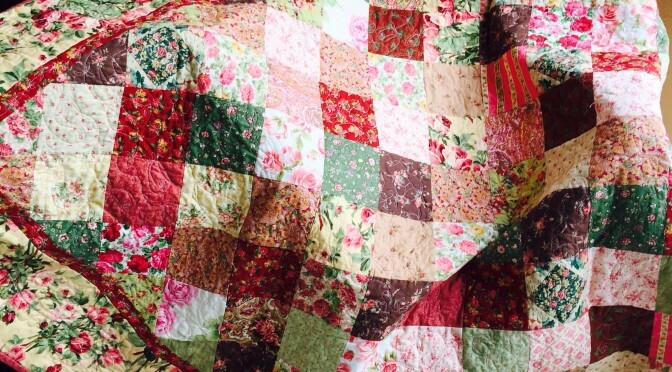 I was inspired to design this quilt because I love roses. I came across a wonderful big roses print which is quite realistic. It features beautiful sprays of dark and light pink roses against a lovely gold background. To make best use of this fabric as a feature I did not want to cut it too small. I decided to use this as the basis of a quilt which is a reflection of roses. 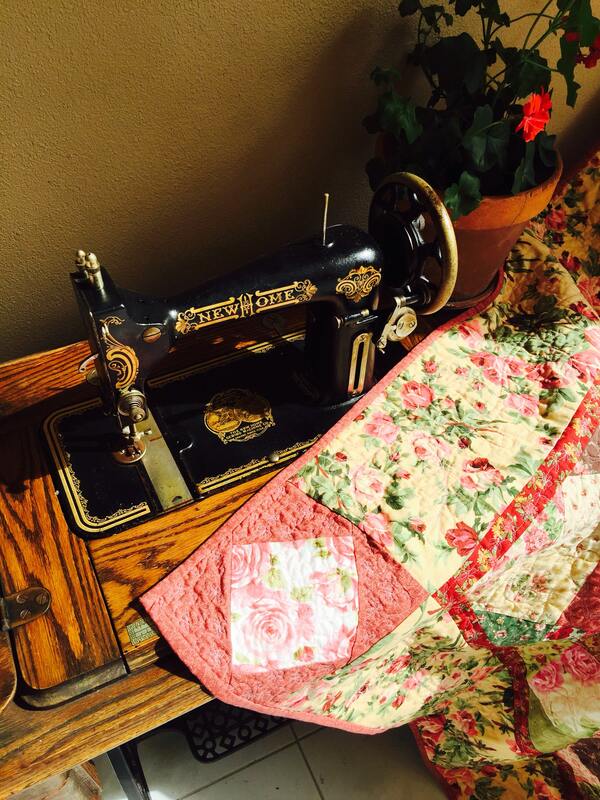 I wanted to bring the garden inside and to do this I gather up as many fabrics as I had with prints and images of roses. I used the focus roses print for the border and colour inspiration. 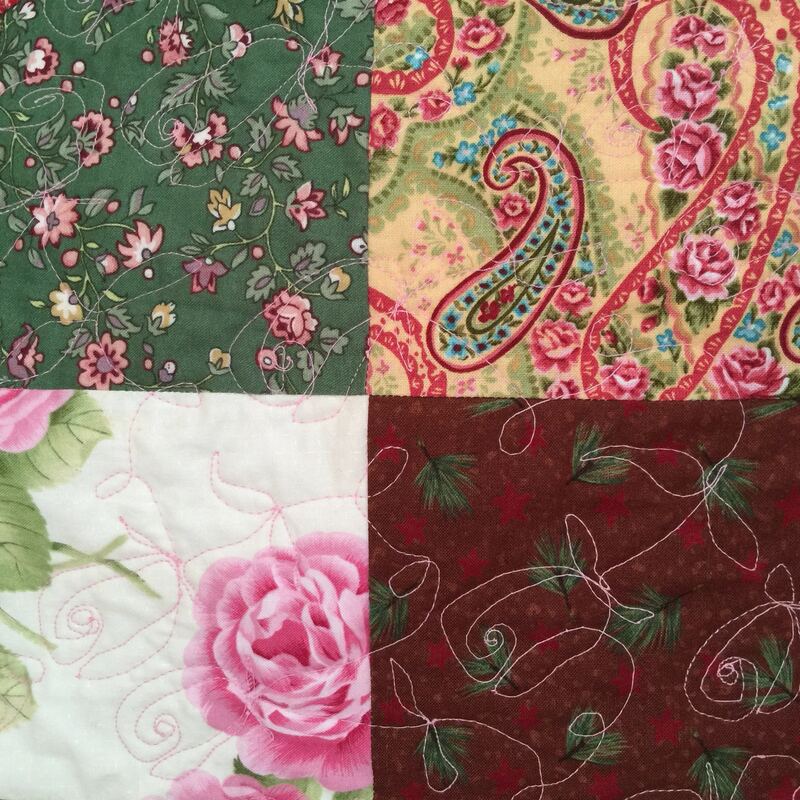 To compliment the theme, I free motion quilted, in pink of course, roses and leaves over the whole centre, daliahs in the corners, daisies in the small border and feathers in the large border. For best results all fabrics should be washed and gently pressed before use. 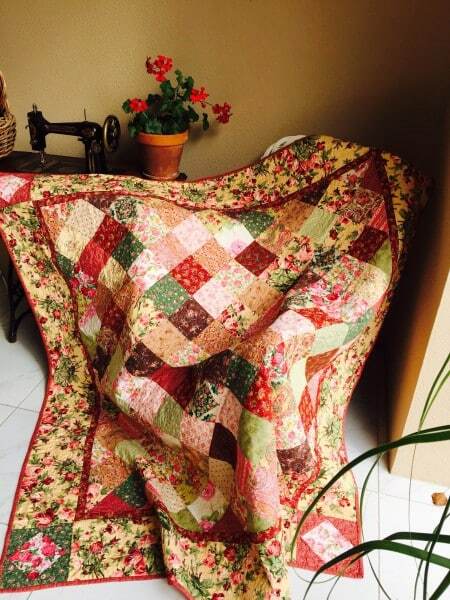 This quilt uses an easy method of construction. Please read all instructions before commencing. All measurements based on a 1/4′ seam allowance. Finished quilt measures approximately 69″ x 69″. Fabric requirements for the centre block. 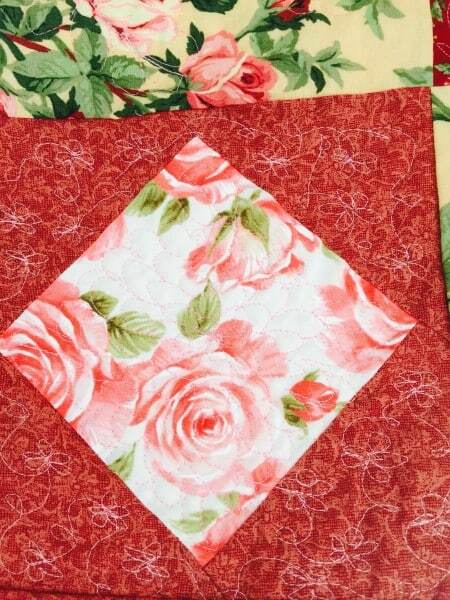 128 x 5″ Charm squares of rose themed fabrics. Use at least 20 different fabrics to ensure variety. 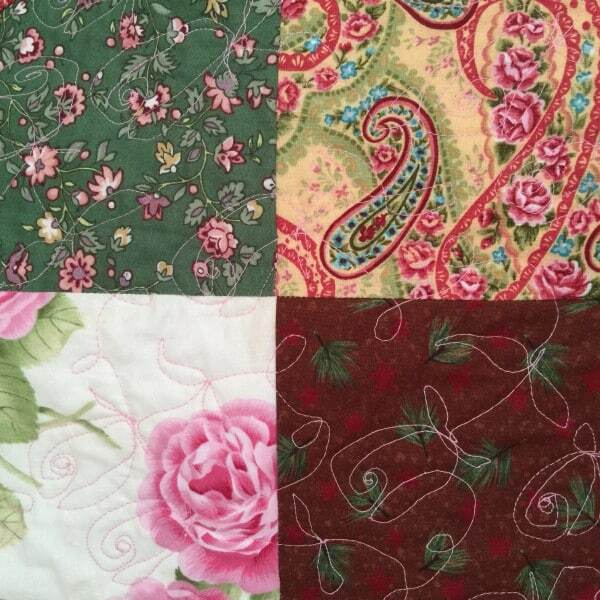 Choose fabrics with white, light pink, rose pink, dark pink, burgundy, coffee, chocolate, light green and dark green. 14″ piece of burgundy rose floral, cut 7 x 1 1/2″ strips of width of fabric for the first border. 22″ of dark pink tone on tone fabric for the binding strips. From the 128 rose themed fabrics, make 32 four patch units ensuring no two of the same fabrics are next to each other and all seams are nested. Press the units. Next, divide the 4 patch units into 2 groups of 16 blocks. Sew the two groups into 2 squares. Now you will have 2 squares of 64 charm squares. Each square being 8 x 8 Charm squares. Press the two squares. Set one square aside. That will be the centre. Take the second square and cut carefully along both diagonals. Now you have 4 triangles. Carefully, pin the long side of each triangle to one side of the 8 x 8 centre square, ensuring all seams are matched and nested. Sew. Repeat with the opposite side. then add the two remaining triangles to the two other sides. Now you should have a square with all the blocks on point. Do not press at this point! Please handle the quilt with care at this point. Cut the selvages off the burgundy strips then sew together the ends to create one long strip. Carefully sew the first border of burgundy 1 1/2″ strips around the perimeter of the whole centre block. Ensure the units are not stretched at this time, as you are working with a bias edge. Press after the burgundy border is attached. For each corner unit, take one feature Rose Charm and 2 dark green or dark pink charms. Cut the two matching dark squares and cut each one once on the diagonal. Attach the long side to the feature Charm square ensuring it is centred. Repeat with the opposite side. Press. Sew the two remain triangles to the block. Repeat to make four units. press and trim to 8″ square. Measure the quilt carefully. 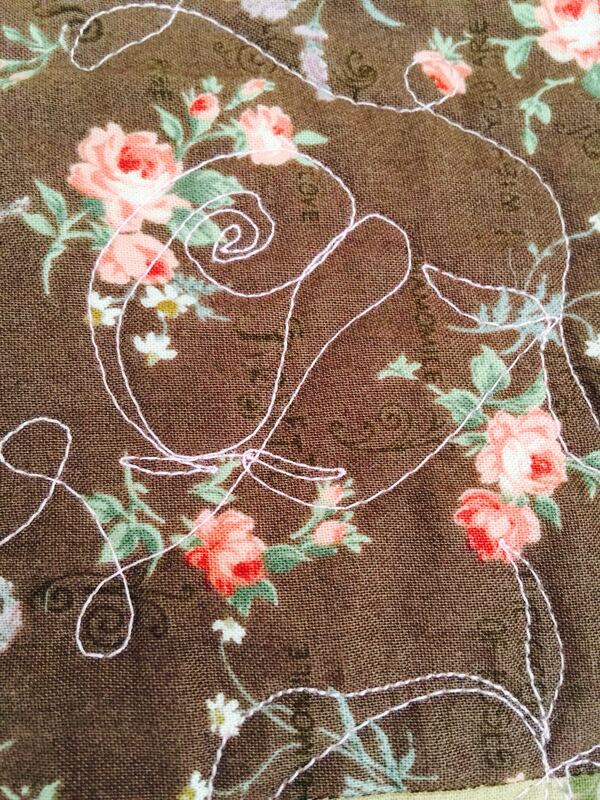 Cut the long side pieces of the rose feature fabric, to exactly match the quilt. Attach to two opposite sides. With the remaining strips add the square in a square units to each end, an opposite one on each side. Sew to the remaining two sides ensuring seams line up. Press.